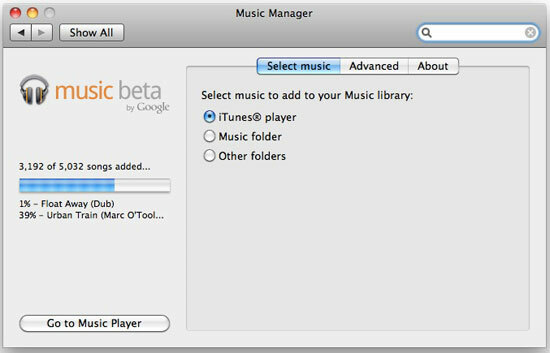 Around noon on Wednesday, I fired up my old laptop, downloaded Google's Music Manager, and started the process of uploading my vast, but long-neglected, music collection to the cloud. Assuming the migration is complete, I'll have a Web-based repository for all the music I've purchased, as a companion to all the on-demand music I can find using Spotify - a match I like a lot. More than 30 hours later, thousands and thousands of my songs are on Google Music in beta. Yet, there are thousands more to go - highlighting a process that may be a challenge for users who may consider making a similar transition. And once they are uploaded, it's not clear if there's a way to get them down from the system if I want to move again. My blogging colleague MG Siegler, he of ParisLemon and TechCrunch, argued yesterday that Google's move to open up a music locker (as Amazon did) without first gaining expensive deals with the music labels, has essentially locked up the market for Apple, who is quite unwilling to lose their leadership position in the market. He argued that the complexity of moving one's library to the cloud, instead of a simpler, faster way of matching your library to a known database and providing you access (as LaLa once did) would be a major stumbling block for the curious consumer. Putting MG's pro-Apple bias aside, there is some truth to that, if a known brand has a simpler solution and an official relationship with approved music downloads, the value to the cloud locker from a competitor is not obvious. As you know, migrating one's library out of iTunes and to a secondary location, be it Google Music or anywhere else, cannot happen for DRM-locked content. 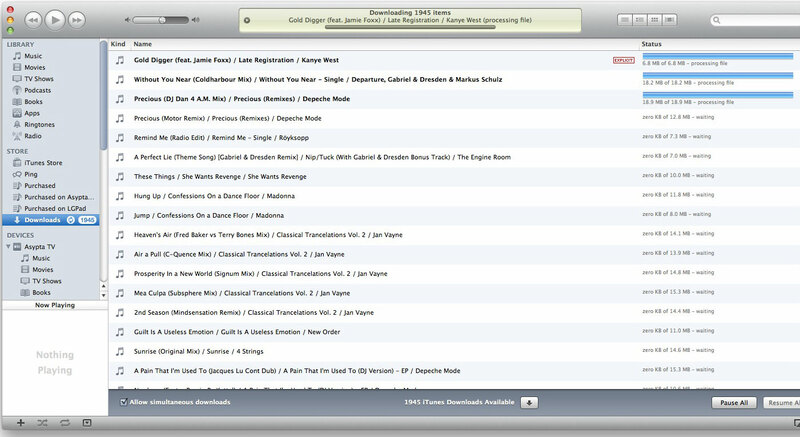 To strip one's iTunes library of the DRM, one must first pay Apple upwards of $.30 per track to upgrade to iTunes Plus. For a library like mine with thousands of tracks, this upgrade can (and did) cost hundreds of dollars - a steep pair of handcuffs, considering one doesn't get any new music in the deal. 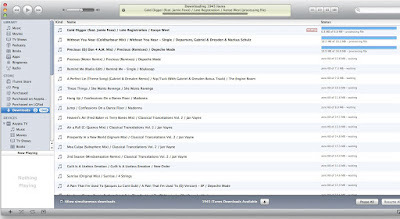 Converting to iTunes Plus doesn't actually upgrade the songs directly, but downloads brand new tracks in their place, and you have the option to delete the old files. With my iTunes library now fully Plusified, Google Music has full go-ahead to get my music and that's happening. At this pace, it's likely the first pass of my full library will complete mid-day or late tomorrow, about 48 hours after I started. This process would take longer if it were on my primary machine, doing other tasks, or constantly interrupting the move by putting the machine through normal on/off paces. Assuming the process completes, I am excited to have all my music in the cloud, searchable and playable from any computer where I am logged in. But as one person asked me, what if Google Music goes the way of Google Wave? I don't think it will, of course, but what if I want to take my more than 50 gigabytes of music down from the cloud, back to a desktop, or move from this service to another? One admirable passion Google promises is the support of Data Portability. Its Data Portability Project is focused on letting users move data in services and out of services. You can see the conflicts over data ownership flare up especially in the battle with Facebook, who let users pull in Gmail contacts, but didn't let Google do the reverse. So I am a little surprised to see there isn't yet a way to bring data out of Google Music. Yes, it's brand new and early, but there's no talk, unless I missed it, about getting your music downloaded - be it one track or many. You can delete songs from the service. You can edit them and all their metadata, but you can't move them once they're uploaded. This means if you don't fully believe that Google Music will be around forever, you might still want to keep a second copy somewhere. There is no doubt a considerable back story to the labels' fights with Google, Apple, Amazon and Spotify. I've heard people say there are hundreds of millions of dollars being promised up front and the biggest payer wins. Google said at Google IO that the expectations were prohibitive and they couldn't agree to such arduous terms. If Apple offers a comparable service on the cloud that knows one's iTunes purchasing history, and can eliminate the need to upload and store songs, but get the benefits of cloud, it will have a leg up in usability. I expect in coming months we will hear more from the Google Music team about improving migration and just how we can be sure we can always own our music.